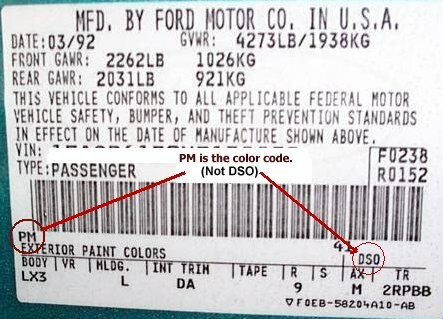 Ford makes it fairly easy to find the color code. It is always on the drivers door jamb. For example, PM/M6599 above we call Bright Calypso Metallic Clearcoat It could also be called Bright Green Clearcoat, Speed Green Clearcoat, etc. depending on what the marketing department decided to call it.